United States Marines of the 1st Marine Division take cover under a disabled DUKW, a 2 1/2 ton amphibious truck, belonging to the United States Army's 454th or 456th Transportation Corps Amphibious Truck Company. The two Army companies were temporarily attached to 1st Marine Division for the Peleliu invasion. The General Motors DUKW was based on the popular "Deuce and a half" 6x6 truck. 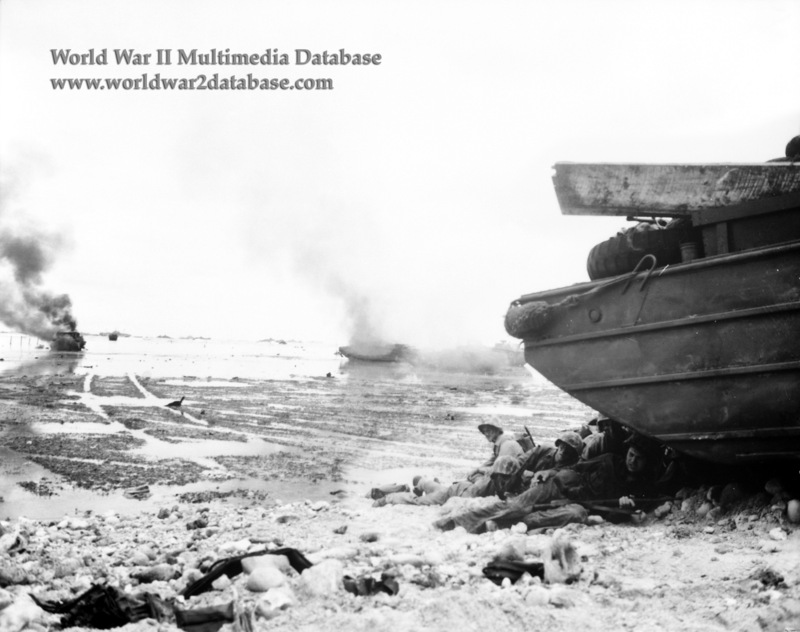 Peleliu was the first invasion the Marines were able to utilize DUKWs, or "Ducks," and the two Army companies had 100 available for shuttling cargo to the beach and casualties to ships offshore. The DUKWs came in the sixth landing wave around 1000 Hours, not being assault vehicles. The Army had fitted them with an "A" Frame crane that allowed the DUKW to carry a 105mm howitzer or a jeep and unload on the beach. Between the line of departure and Peleliu's reef edge, Japanese shells began to randomly fall among the circling LVT-4s and DUKWs. An American smoke screen dissipated after drifting seaward, revealing DUKWs and LVTs burning. Over sixty vehicles were disabled or destroyed as they crossed Japanese mines improvised out of aerial bombs, and sustained fire by anti-boat guns from "The Point," uncharted high ground firing on the left flank of White Beach 1 (assaulted by 1st Marines), and an unnamed island and Ngarmoked Island firing on Orange Beach 3 on the extreme right flank (assaulted by 7th Marines.) Less fire fell on Orange Beach 1 and the 5th Marines. The DUKW lacked any armor, so even rifle fire could cause casualties among passengers and crew. The Japanese targeted the landing craft with heavy weapons to kill as many Americans as possible with a single hit. The numbers of amphibious craft were further reduced as LVTs and DUKWs took wounded all the way out to the medical ships beyond the line of departure.